The weather might still be hot, but seasons are changing and we are just starting to see the colors of fall. We will pack up our swimsuits this week and trade them in for jeans and fall sweatshirts and plan weekends around college football and fall festivals. One of our favorite things to do is to head out to the farms and fields to apple pick! The Kansas City area is rich in local producers and it is a great way to teach children on food sustainability and supporting local farmers. This is a quick look at one of our favorites. The Hayrides out to the Red Barn Farm Pumpkin Patch started this weekend! Located about 25 miles from Downtown Kansas City, the Red Barn Farm takes you back to living in the country. Sprawling hills, trees, and an extensive apple orchard makes this one of our top spots to take the kids. The Weston Red Barn Farm offers an experience in a real American farmstead. Farm animals are on hand and there is a real sense of working together on the farm. The Farm Market offers fresh local produce and farm fresh eggs from Red Barn Farm chickens and long horn ground beef that is locally raised at Long Livestock. 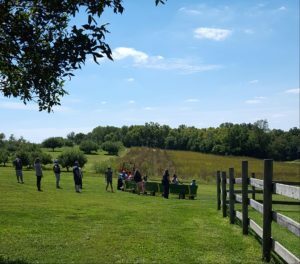 Hayrides, a corn maze, pumpkin and apple picking in the fall (and blueberries in the summer!) make this destination a fun day trip worth the drive. Labor Day weekend is the official opening of the Fall Festival- admission is free on weekends and runs through November. (Different activities have a minimal cost and you only pay for the activities you want to do!) The Dinner Bell, Red Barn’s onsite kitchen serves fun farm food on weekends in the fall. Stop by for a grilled hamburger or hot dog, fresh baked cookie, apple cider slushy(our personal favorite) and more. 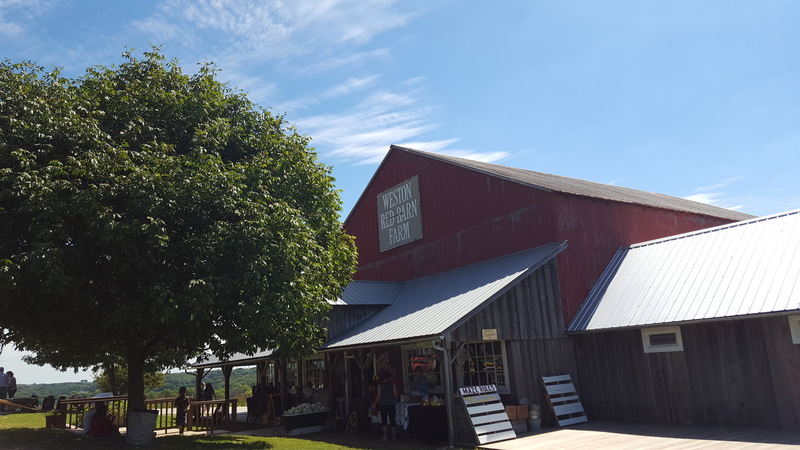 Before leaving Weston: Head across the street to The Farmer’s House Farm Market location and pick up a delicious pie …sugar free apple, apple, cherry, peach, very berry, pumpkin and pecan are available. The Market provides a community-integrated, hands on work environment where participants with developmental disabilities learn valuable vocational skills by experiencing all aspects of running a small business. All purchases support this program, one that is very near and dear to our heart. Not planning a visit to Weston anytime soon? Check out their Westwood Hills location and read more here! Alldredge Orchards is a family farm situated in the foothills of the Missouri River six miles south of Platte City, Missouri, and just 25 minutes from downtown Kansas City. Alldredge offers u-pick apples, a pumpkin patch in October, a rustic barn store, a bakery/cafe, an awesome playground, and friendly animals. An old favorite: Louisberg Cider Mill in Louisberg, KS. Watch the process of fresh cider being made and pick up a delicious cider doughnut. Not exactly apple picking, but a great family friendly place with a pumpkin patch, corn maze, and mouth-watering doughnuts, hot and cold cider! 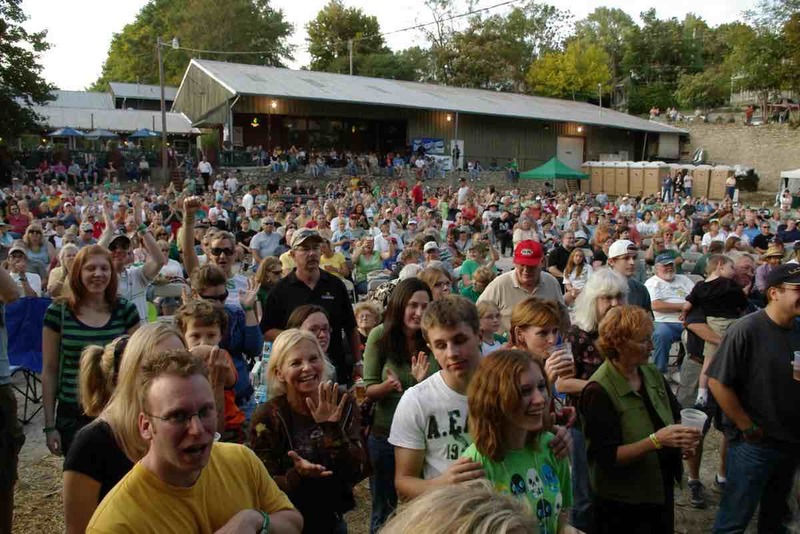 Ciderfest is set for September 24th-25th! Previous articleEnd of Summer KC Style!